Behaviour assesment: in laboratory conditions, serving as base testing for assessing general sensor behaviour. Characterisation: also in laboratory conditions, assess generic sensor parameters as sensitivity, zero and span. Modelisation with real world deployment: including other variables such as environmental factors and sensor cross-sensitivity. Each of these stages apply differently depending on the type of sensor. 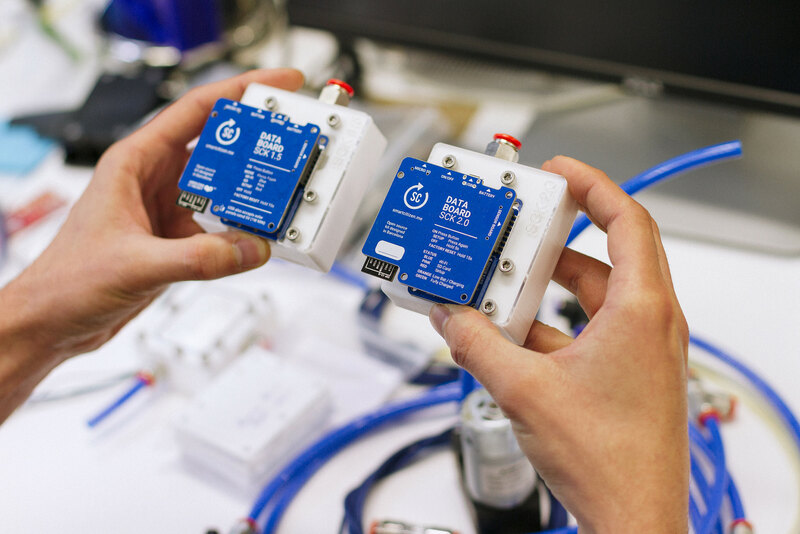 For instance the electrochemical sensors present in the Station are already characterised by the manufacturer, while the Metal Oxyde Sensors in the Urban Board of the Smart Citizen Kit are not. The different characteristics of these sensors make different calibration approaches to be carried out. An initial behaviour assessment is to be carried out in laboratory conditions in order to determine the optimal operational modes. This includes basic parameters such as sensor response, heating time and temperature as well as more advanced ones such as heating pulse mode operation. For this purpose, a portable, open source, reproducible test cell has been developed for controlled testing with a web based acquisition interface. Zero: the sensor reading in zero air (pure air at 25degC). Finally, after this initial calibration assessment, it is critical to gather as much data as possible from long term sensor deployments. These deployments should aim to cover the widest range of sensor exposure conditions, in order to generate robust models. While dealing with low cost sensors this stage is very important, as it is detailed in the sections below. These needs make machine learning methods great canditates for modeling the data. These methods are implemented in the Sensor Analysis Framework, as well as other more traditional linear methods. 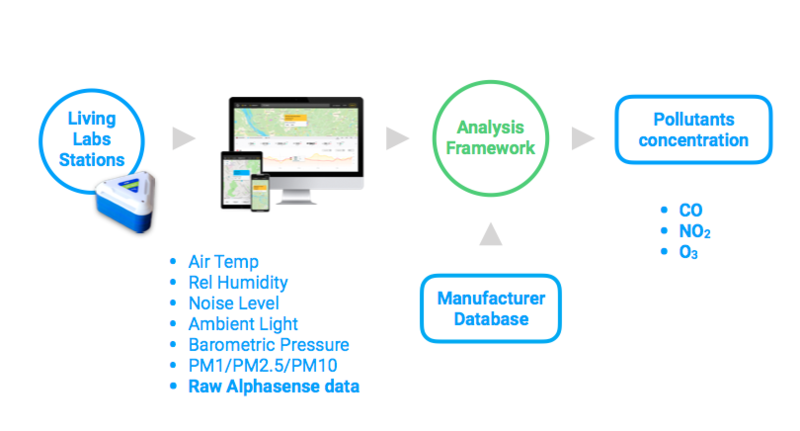 The combination of these algorithms with large amounts of data gathered during the iScape project offers a great opportunity to demonstrate the use of low cost sensors for air quality monitoring. Due to their construction, low-cost metal oxyde sensors suffer from high levels of spread in their baseline resistance and sensitivity. As well, these sensors are generally reactive to other pollutants in the atmosphere, with a low selectivity of the actual target pollutant and drifts in their behaviour can be seen after some weeks of exposure. As well, metal oxyde sensors show short and long term drifts in their calibrations. Therefore, metal oxyde sensors require a careful characterisation and modelisation in both, laboratory and open air conditions. Initially, a sensor characterisation in laboratory conditions is needed to assess sensitiviy, baseline resistances sensor-to-sensor spread, aiming to obtain normalising factors for each sensor or group of sensors. Once deployed, data from the Smart Citizen Kits is ingested in the analysis framework and referenced with other sources, such as a Smart Citizen Station or another reference equipment available. 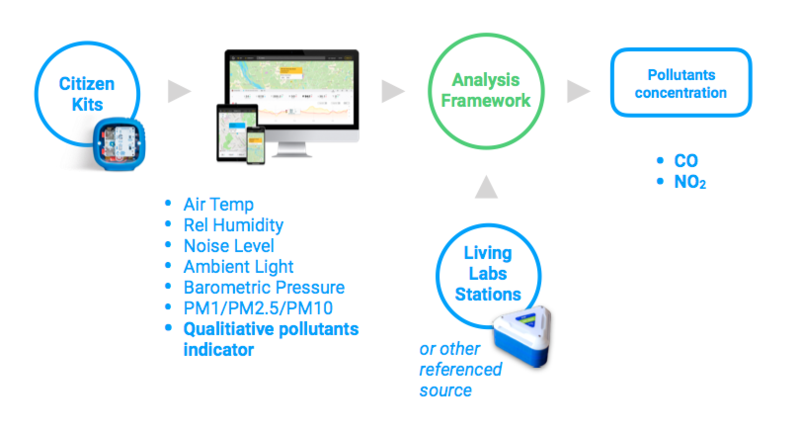 When CO and NO2 reference data is available from nearby Living Lab Sation or other sources as EPA stations the iSCAPE Sensor Analysis Framework can be used to estimate the absolute values from the Smart Citizen Kits NO2 and CO sensors. After data collection, a sensor re-assessment can be performed, either in laboratory conditions or collocation with reference equipment. This stage serves for correction for the model parameters used during the deployment and to assess the sensor reliability and need for replacement. This approach might not always be possible. Then, CO and NO2 data should be considered as qualitative air pollutants indicators. We should qualitatively use the data to compare short time intervals (no longer than a week). We can ask questions as Is pollution higher at night? Electrochemical sensors can achieve significant accuracy, but they require a particular data post-processing that combines the measurement at the sensor electrodes with the sensor characterisation on the factory as well as other environmental parameters as air temperature and relative humidity (i.e. absolute humidity). Luckily the manufacturer of these sensors, Alphasense, provides us with that reference data. However, the complexity of the operations performed can not be done inside the sensing device as it uses advanced operations as well as historical data from the same device. For that reason, the data needs to be post processed using the Sensors Analysis Framework. The algorithm is in a beta stage and later it will be applied automatically on the data once it arrives at the platform. More details can be found in the Electrochemical sensor baseline methodology Section. This process doesn't require any on-site reference data but requires the data to be processed using the manufacturer calibration reference per sensor as well as other environmental values as temperature and humidity. When referenced data from a nearby referenced source as an EPA station is available, the iSCAPE Sensor Analysis Framework can be used to validate the recorded data as well as performing the standard post-processing. The selected PM sensor is as well, characterised by the manufacturer and it provides an accurate measurement with it's calibration. It's measurements can be as well improved when reference data is available, as some have noted that the PM sensors can be affected by relative humidity. Read more on the Plantower PMS 5003 implementation on the Gas Pro Sensor Board.